BTCUSD Confluence of time, price and lunacy cycles. WD Gann is a fairly common name in trading. He was one of the great father’s of technical analysis… and also one of the most mysterious and peculiar. Practitioners and proponents of Gann theory utilize a great number of his theories and approaches to market forecasting. The most important of those tools is time. Time is the most important factor according to Gann. Time rules all things and that is not limited to just the markets, it is applicable to the world and world events. Gann predicted World War 2, he predicted who would win the war as well. His forecasts predicted the market lows of the Great Depression, the lows of 1970 (he died in 1955), 2008 and, according to his calculations, 2019-2021 is the next great panic. The major point of Gann is that time is the most important factor. One of the very important concepts of Gann theory is his time cycles and the confluence of price and time. 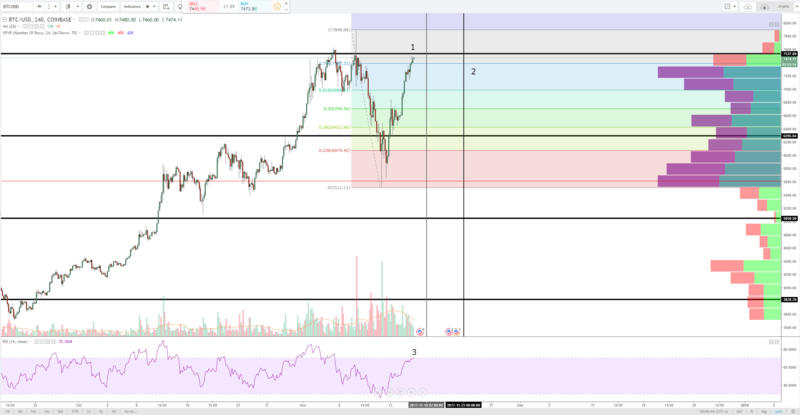 Currently, BTCUSD is approaching a confluence of price and time. Gann stated that when time and price are squared, changes do occur. There is a number of powerful element’s coming into confluence in the next few days. Please refer to the numbers in the chart above for the text below. The top, thick horizontal line represents a natural harmonic level for BTCUSD. Harmonic levels on price charts are constant levels thrust onto a chart that begins with the lowest historical price traded price of any instrument and the highest price of any instrument and then finding the nearest squared number above and below, respectively. Each of these levels has their own ‘behaviors’. The very top horizontal line represents a major pivot area, it’s an extreme harmonic range. Additionally, the gray vertical line is the start of a new moon. Note about the lunacy cycle (or, simply, the Moon Phases) in Gann theory is that short and longterm market lows are generally found at full moons and short and longterm market highs are found at new moons. 11/18/2017 is the date of a new moon, which means there is a strong probability of price trending down from this high. One of the many time cycles a trader can use with Gann is the Law of Vibration. This law is both a constant and consistent pattern in all markets and also a period of days. In this case, the thick vertical line represents the beginning of another cycle. Which, not a coincidence, is near the .786 Fibonacci retracement level of the most recent swing high and swing low. Consider the RSI level here as well, we have overbought conditions, but that doesn’t really matter much in such a strong uptrend environment. However, it should be noted that the ending of time cycles is not always a guarantee of price reversal! While very strong evidence for a bearish bias on this pair based on technicals is warranted, the price structure could just be the formation of a new consolidation zone before another move higher, if that is true then the normal behavior of price at these time levels would be a significant breakout to the upside; continuations at the end of many Gann time cycles are not uncommon. Looking at fundamentals, I believe it would be very dangerous to assume a bearish bias based on this very strong and obvious bearish setup on technicals. There is significant value being assessed with cryptocurrencies in general and it is being more openly discussed in ‘normal’ news outlets. More importantly, is that the CME (Chicago Mercantile Exchange) is planning the rollout of a Futures contract for Bitcoin; possibly before the end of the year. If/when that happens, there will be few barriers that exist for Bitcoin (and, probably other crypto coins) to be recognized as a ‘legitimate’ speculation and investment tool.